About: John T.Woodall - talented artist from Charlotte. John Woodall is a former AppalachianStateUniversity student who has performed in across the United States. He currently lives in Charlotte NC, where he performs regularly with his band. He also gives solo performances throughout his area. 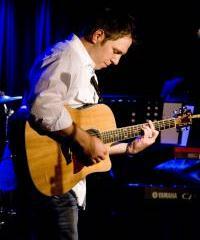 Woodall is a songwriter and guitarist known for his original music and his ability to put a fresh spin on familiar songs old and new. He is currently looking for other artists/producers to collaborate with in the studio. First thing in the morning when I am still in an almost dream state but my mind is rested and fresh. I am pretty partial to where I am and but I think I would have loved the 70's. Dinner. I love to cook, but none of the other meals allow me to cook the way that dinner allows me to cook. It would focus on social justice and also loving one another by using open communication. I would call it The Colors Within. I would immediately give half of it to my family and the other half I would give to either researching cures for cancer or I would give half to the families of those men and women who sacrifice so much of themselves by fighting for our freedoms.